I kinda love the bento box pattern. I don’t know if you can tell from my other quilts here here and here. Oh wait- here too. I have never made one for myself, but I think that will be coming soon. I am having trouble giving this one away. But I did tell the bride it was coming, so I don’t have much choice. I was trying to keep it a secret, but the wedding is tomorrow so the chances she is checking my wee website today are pretty slim. I am so relieved to have this quilt done! So many projects to get working on, family arriving soon and our annual huge July 4th party next weekend. July 5th I will be hiding out for a while to prepare for my “Artist of the Week” table at the Lansdowne Farmers Market, July 25th. I am planning to relax in August! The design has evolved. For the bride’s wedding shower I made 2 pillowcases out of some of the fabric. It took her a minute to realize what they were, but she seemed to like the fabrics, the comedy of the situation is the edging I used was the ship fabric and I took it out of the quilt because it just didn’t match very well. 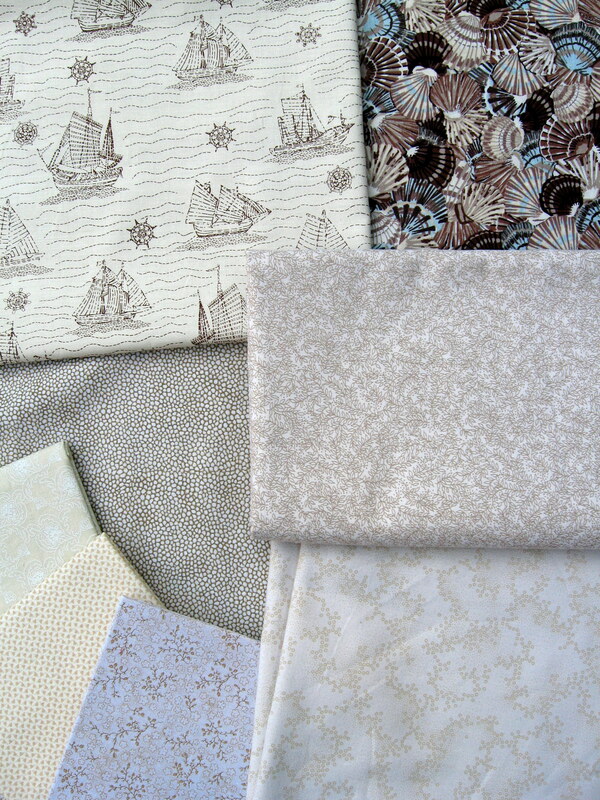 I found a fabric with sand dollars that I added and I had some good luck with fading the sea shell fabric. Thanks Rhea for the Martha Stewart sugestion! I found that article and it suggest 2 to one water to bleach. It was pretty good result but it made it very yellow. I picked up some Rit Color Remover (you know, next to all the Rit dye that you use for tie dying) and that got rid of some of the yellow and and some more color. now, here is the real question, did I succeed in making a white and tan quilt? She got all of her bedding at the wedding shower and every last bit was “hotel white” which is what sent be back to the fabric store to pick up that white on white print that I like to think looks like sea urchins. Fingers crossed that it is “white” enough… Oh and fingers crossed that I will find the time to quilt it before the new years wedding! I am pretty confident that the wedding couple don’t read my blog, but just in case I will not say my initial emotions on the wife-to-be’s requested “white and tan” quilt. Although, I guess you can read between the lines so I might as well say it seemed a little boring to me. The husband-to-be enlightened Paul a little by saying they had a beach theme in the bedroom, so I got a lot more excited to make something with a theme. And it is always better to make a quilt they will use than make a quilt they want to hide so, I picked up an ivory flat sheet at Ikea and the below fabrics at Joann’s Fabric. I am toying with trying to bleach the shell fabric. Just to lighten it a little. But maybe I can work it in to a pattern without making it look totally foreign. Anyone out there tried to artificially fade a quilting cotton?